I have a feeling that my beloved study group are going to be gaining quite a bit of interest this year. I would love to say that it is a result of some ground-breaking research I have conducted, but alas. The true reason why I think 2015 is The Year of the Ant, is the impending release (that’s 16th July) of Marvel Studio’s Ant-Man. 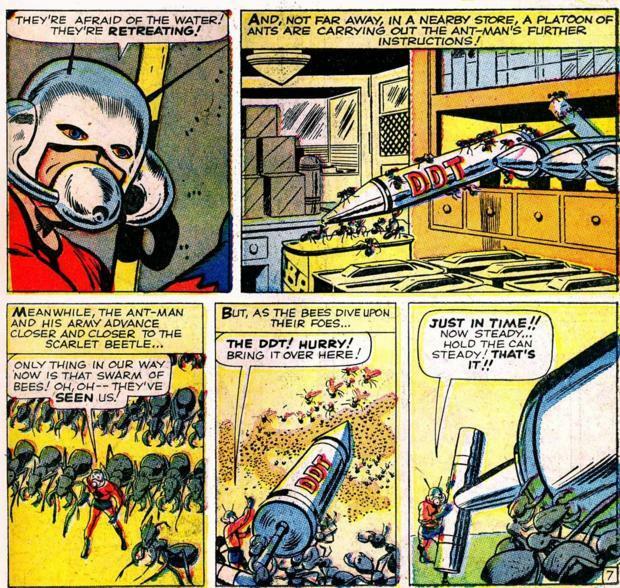 For those of you that are perhaps not on my level of Marvel fandom, Ant-Man is based on the comic of the same name, where the protagonist has the ability to shrink down to the size of an insect and has superhuman strength and agility. Although in my spare time I’m still trying to discover Pym Particles, my full time role involves being a PhD student here at the UoA and looking at assessing invasive species risk to native ecosystems, using ants as a model. Unfortunately for our native environment, when it comes to exotic species arriving and establishing in New Zealand, we often let them slide by if they don’t have a perceived potential social or economic impact. As a result, we end up with exotic plant and animal species that become naturalised in the environment. How do they affect the environments in which they naturalise? Well in most circumstances, we don’t really know. Here in New Zealand we have 29 established exotic ant species (compared to only 11 native species) and very little understanding of how they are influencing the environments in which they live. The Argentine Ant is the species most people would have heard of, as it is a well-known invader worldwide, causing various negative impacts on the environments in which it invades. But what of the other 28 established exotic species we have in New Zealand? What are they doing? I don’t have the answers… yet, but for my PhD I’m specifically going to be looking at the ways exotic ants influence the invertebrate community structure within different ecosystems, as well as investigating their role in altering ecosystem function. 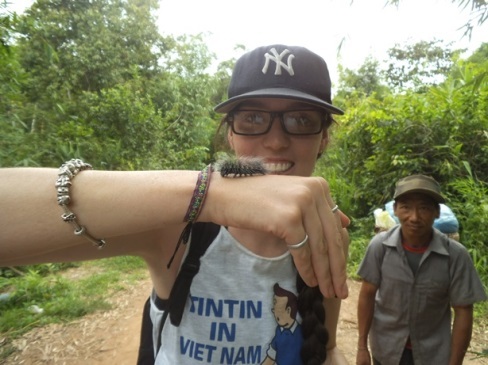 This will involve conducting different manipulative field trials over the upcoming spring/summer seasons – and I’m always on the lookout for field assistants, so let me know if you want to spend a day in nature out with me and the ants. P.S. Marvel Studios, I am indeed open to sponsorship. Recently I just said goodbye to roughly 200 guests. They were not thankful for the hospitality I showed them, they sometimes disliked the meals I served, so much so that they would rather starve than eat, and when I showed them to their new living quarters they would vomit on me to show their disapproval. I still really liked them though. My guests were most probably from Australia, but their descendents are all over the world. Their full name is quite a mouthful, Henosepilachna vigintioctopunctata, but we are on a first name basis now, so I go with the more common ‘hadda’ beetle. The hadda beetle was first discovered in Auckland, New Zealand in 2010 and is a well known pest of a large range of crop species, like potatoes and tomatoes from the Solanaceae family. As part of my MSc, I’ve host-tested the beetles on some native New Zealand Solanaceous plants, like poroporo (Solanum aviculare). Many native New Zealand plants are in decline, and native Solanaceous plants, like poroporo, are important food sources for our fruit-eating bird species. Adding more pressures, like a Solanaceae-munching hadda beetle, could push them further into decline. To test the beetle’s host range, I did a series of experiments that could not only tell us if the beetle would eat the plants, but more importantly, if the beetle could maintain a self-sustaining population on our native plants. I used the ‘no-choice’ host-testing method, where the beetle is confined to one type of plant and the ‘multi-choice’ test, which allowed the beetles to ‘choose’ to eat or oviposit on a plant from a range choices. Early results show that hadda beetles are indeed happy to munch away and lay eggs on NZ’s native solanums. But to what effect on our plant populations? 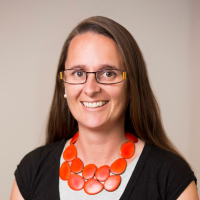 Watch this space…..
We all know marriage can be hard work – lots of fun and good outcomes when all goes well, but partners come with different experiences and expectations and compromise is usually needed. So it is when research institutes forge partnerships. 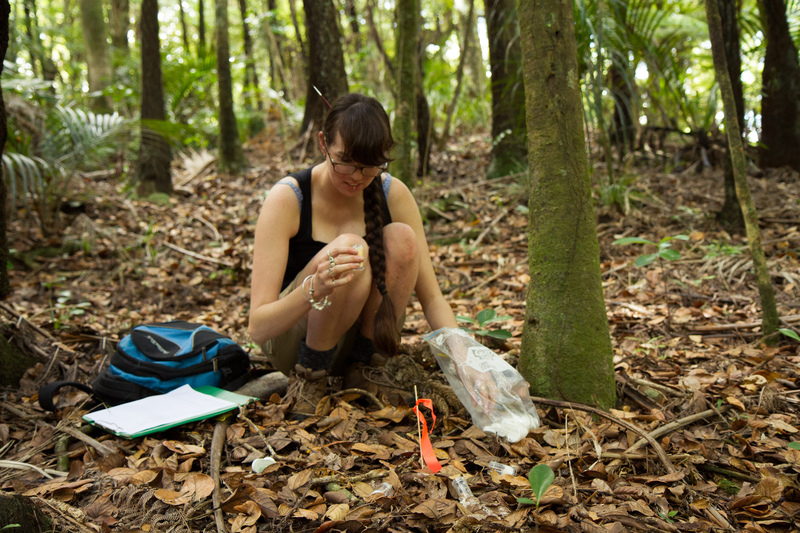 The University of Auckland and Landcare Research jointly formed the Centre for Biodiversity and Biosecurity in 2005 to foster excellence & relevance in research and related postgraduate teaching. So now it is time to celebrate 10 years of successfully working together with a 1-day symposium on Wednesday 1 July 2015, Owen Glenn Building, University of Auckland (city campus). All are welcome to attend, but please RSVP to c.warner@auckland.ac.nz for catering purposes. Our plenary speaker is Professor Mark Burgman, University of Melbourne, who will be speaking on “Problems and solutions in expert judgement of biosecurity risk”. And like any celebration of a long-term partnership – there’ll be plenty of good food and drink, and friends to share it with. I was recently asked by an engineer friend of mine what my PhD project was about. In my (failed) attempt to put it into simple words, I ended up giving him a large discourse on the topic. A couple of days passed and he got back to me to say “… I always thought biological systems were simpler”. I am new to this world of ecological networks, but simplicity is not a word that can be used to describe them. More specifically for animal-plant mutualistic networks, a set of animals interacts mutualistically with a set of plants that are connected to another set of animals that interact with another set of plants. Animals disperse a plant´s genes and get food as a reward, as in the case of pollination and seed dispersal ecosystem services. The dynamics of these networks and how they are built have profound implications on the coexistence of species and moreover, they can give us insights about how resilient they are to human disturbances, such as habitat fragmentation. It has now been recognised that conservation efforts should not only be directed to species alone, but should also be extended to the interactions and networks they form. Loss of interactions would translate into loss of ecological functions and this could happen even before actual species extinctions, a concept known as extinction debt of ecological interactions. Daniel Janzen, a pioneer scientist in tropical ecology, stated more than 40 years ago that “what escapes the eye, however, is a much more insidious kind of extinction: the extinction of ecological interactions”. So, we really are talking about complexity when we talk about networks. And I’m glad I changed my friend´s perception of just how complex biological systems are. New Zealand’s native pigeon, the kererū, are important seed dispersers as they swallow fruits whole. Having spent a fair amount of time wandering around Auckland city with a large blue antenna, I have been stopped and asked what I am doing quite a bit. Whilst it was very tempting to tell people I was looking for aliens or just trying to get a good signal for my phone, I did eventually explain to them that I was radio tracking kererū (NZ pigeon; Hemiphaga novaeseelandiae). 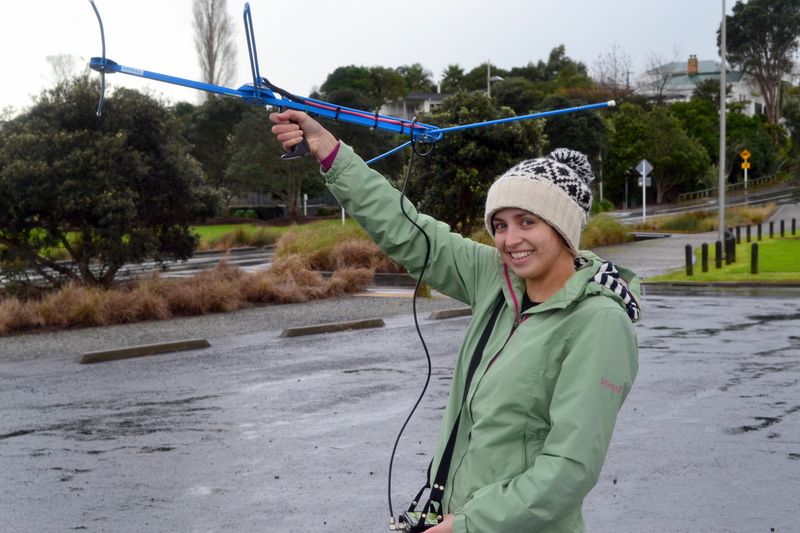 Alice radio tracking kererū in urban Auckland. On the whole, people seemed pretty interested and would often tell me about the kererū they see around the city. This got me thinking, perhaps there was a way I could get people to record this information so I could get more of an understanding of where kererū were in the city and where they weren’t. 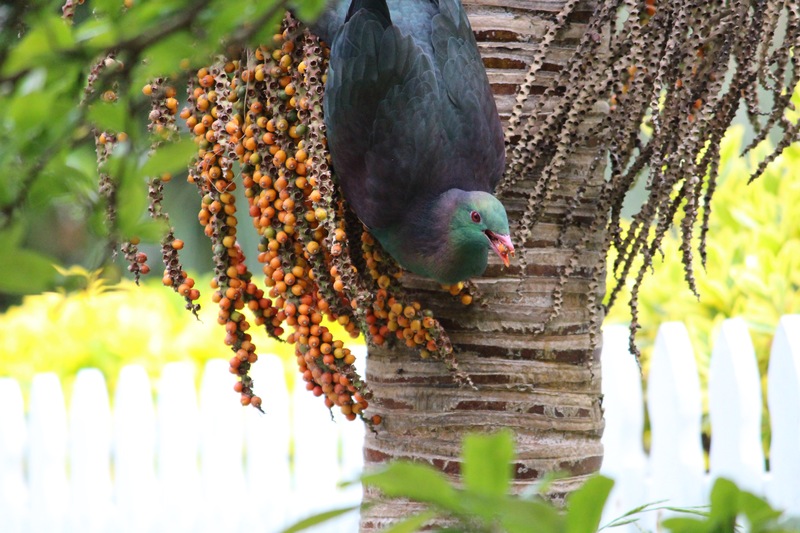 So I created a website, imaginatively entitled ‘The Auckland Kererū Project’ as a platform where members of the public can record their sightings as well as information on the plants in their gardens. The use of volunteers in research, also known as citizen science, has long been a tool of ornithologists and ecologists – the Audubon Christmas bird count in the US is one of the longest running having started in 1900. More recently the number of citizen science projects has been increasing, helped in part by the internet and the advancement of mobile technology, which has led to much easier data collection. One of the main benefits of citizen science is that very large data sets can be collected often over a large geographical area and time scale, much larger than what could be collected by a single researcher. Data can also be collected from private land, removing the access issues researchers often face, especially in urban areas. Participants in citizen science can also benefit through increased knowledge and appreciation of the local biota and issues in their local community and through gaining an insight into the scientific process. Alice is studying how kererū move around fragmented landscapes and more specifically how they utilise the urban environment. There are some drawbacks, however, that must be taken into account during data analysis. Participants often have variable skill levels which can lead to issues with data quality. Variations in sampling effort both in time and space can also be a concern. Despite these issues, citizen science is a great tool and is likely to become even more prevalent in the future. Want to get involved? 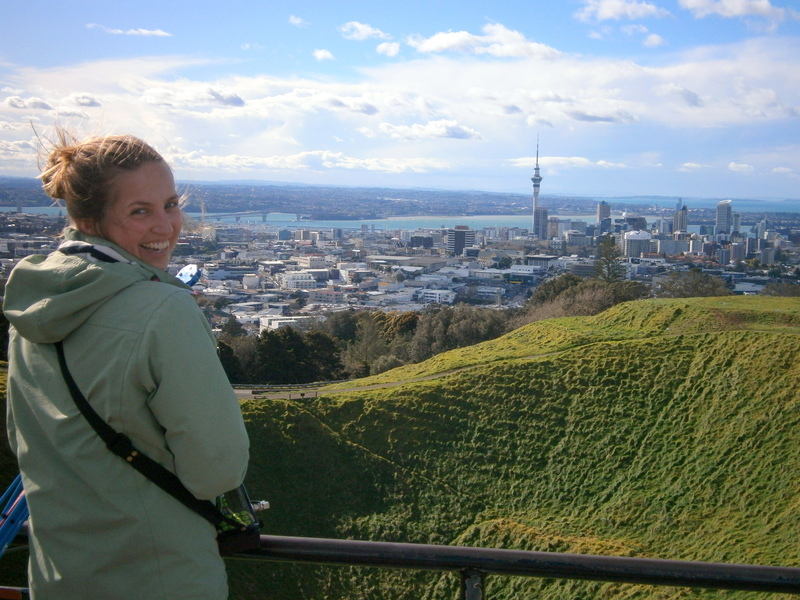 There are many citizen sciences projects in New Zealand – one of the largest is NatureWatch NZ, which listed many different projects you can get involved with. Or how about Landcare Research’s annual garden bird survey? But of course don’t forget about the Auckland Kererū Project! 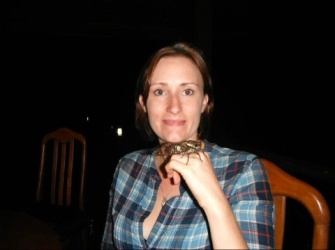 Alice Baranyovits is a PhD student at the Centre of Biodiversity and Biosecurity, School of Biological Sciences, University of Auckland. 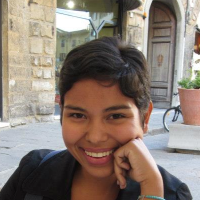 She is researching the movements of kererū in urban areas and the implications on seed dispersal of native and introduced plants. She is supervised by Mick Clout, Jacqueline Beggs & George Perry. A government funding windfall to the Dryland Forest Initiative was reported in the NZ Herald today. The plan is to breed and grow drought adapted eucalypts in dry regions of the country with less than 1000 mm of rainfall per year. Seems like an excellent plan. Eucalypts grow quickly, rapidly accumulating carbon in high quality wood. Even better, they are very comfortable in dry conditions. Sounds like a perfect ‘environmentally friendly’ product. But what about the water cost? As I explain in this post, trees use vast amounts of water. A single tree can use over 2000 litres in a day and a stand of trees may use 90% or more of incoming rainfall. This means less water for other activities in the catchment including water required to maintain stream health. Eucalypts will exploit water resources as they become available with deep roots often accessing groundwater and physiological processes rapidly responding to rainfall events. As droughts become more frequent, eucalypts are likely to remain healthy but they will use scarce water resources. Any plans for plantations or increases of woody vegetation in dry regions need to include a consideration of the impact on catchment water yield. A local water budget that includes groundwater is vital to ensure there is enough water for all purposes during dry periods. The often unseen impact is that groundwater become depleted over time. The trees will be fine because they are used to dry conditions but the rest of the system may not be alright.